A manager from a public health department shared a story with us of using an implementation toolkit developed by the Registered Nurses Association of Ontario. Their public health team used the tool to guide their decisions regarding plans to implement a new program. According to the manager, the toolkit provided a “fantastic roadmap” to guide them through the process. What led them to this tool? The team was in a situation where they had made a decision to implement a new program, but got stuck finding a way to get organized and plan for the implementation. 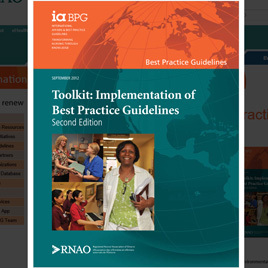 The manager saw the RNAO toolkit on the National Collaborating Centre for Methods and Tools (NCCMT) website and read our summary of the tool. The manager realized that, although they were not implementing guidelines, there was plenty in the toolkit that would help them organize their approach to implementing the new program. The team was impressed that it also guided their evaluation plans by providing ideas for indicators. The manager says that the staff felt much more confident and organized in going forward with the program and the evaluation plan as a result of using this toolkit.